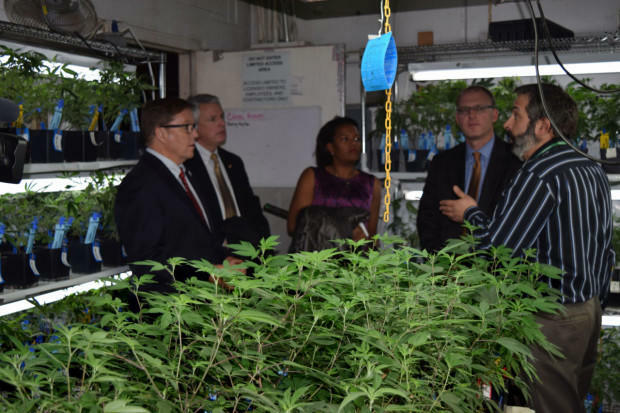 A delegation of Massachusetts State Senators visited Colorado last year to look at that state's recreational marijuana industry. Massachusetts municipal officials are trying to figure out how to implement the voter-approved law that legalizes marijuana for recreational use. There’s a lot to do before pot shops begin to open in Massachusetts in a little more than a year from now. Most elected officials in Massachusetts did not support the marijuana legalization referendum, but because it passed they now must deal with a range of issues including taxation, zoning, and likely impacts on public safety and health. Springfield Mayor Domenic Sarno said the city is in uncharted waters.
" So I think we have to very structured and defined in this issue and I am maybe looking for a time-limited moratorium," said Sarno. Sarno, who opposed Question 4, said this week he will consult with the city’s attorneys, officials who oversee planning, public safety, and public health, and the city council to work on local regulation issues. The law, which voters approved by a 54 percent to 46 percent margin, gives local communities an option to ban marijuana shops through local referendums. The number of shops can be limited to 20 percent of the licensed liquor stores in a community. Also, the location of the stores can be restricted and the hours of operation and signage regulated. Some mayors told the Boston Globe after Question 4 passed that they were open to launching a local ballot question to ban marijuana stores from their cities, but Sarno said he is not inclined to do that in Springfield.
" The people have spoken and I respect that," said Sarno. " I just want to make sure if the facilities open here they are run properly and the rules and regulations are concrete to deal with the issues I've brought up." Springfield voters approved Question 4 by a 57 percent to 43 percent margin. Sarno is calling on the state legislature to look at a more progressive tax on marijuana.
" I think the costs are going to outpace the revenues that come in," said Sarno. The voter-approved law sets the total tax rate on a marijuana sale at 12 percent. That rate, which includes an optional 2 percent local tax, is far below the tax rates in other states where marijuana is sold legally. In Colorado, a state with a similar population to Massachusetts, the tax rate on marijuana sales is 25 percent. State Treasurer Deborah Goldberg, who will be the top regulator for the new marijuana industry, wants state legislators to extend the January 2018 start date for retail shops to open to allow time to write regulations and put an enforcement bureaucracy in place. State Senator Eric Lesser of Longmeadow said the legislature should not extend the deadline.
" We owe it to the public, the business community, and law enforcement to make sure it is implemented quickly and effectively," said Lesser. Massachusetts voters approved medical marijuana in 2012, but the Springfield City Council just this week approved a host community agreement for the first dispensary in the city. City Councilor Adam Gomez, who chairs the council’s Health and Human Services Committee, believes the opening of recreational pot stores will occur more expeditiously.
" Recreational ( marijuana) is here," said Gomez. " By January 2018, I expect the lawmakers on the state level to create those policies so that recreational ( marijuana) can come into Springfield the right way." The new law makes it legal as of December 15th, 2016 for people over the age of 21 to possess up to an ounce of marijuana and to grow up to six plants at home. Come November 8th, voters in Massachusetts and Maine will consider making recreational marijuana legal for all adults. WAMC's Capital Region Bureau Chief Dave Lucas reports on what impact electoral victories in these nearby states may have on New York State. Massachusetts voters Tuesday legalized marijuana for recreational use by adults, and soundly rejected a proposed expansion of charter schools in two of the most watched and hotly contested ballot referendums. Holyoke Mayor Alex Morse has become the first mayor in Massachusetts to announce support for legalizing recreational marijuana, a stand that puts him at odds with other mayors and elected officials across the state. Morse announced he plans to vote “yes” on question 4 on the Massachusetts election ballot this November which, if passed, would legalize recreational marijuana use for those 21 and older and authorize creating a system of retail marijuana stores, cultivating facilities, and manufacturers of edible products. As Massachusetts considers legalizing marijuana, medical and law enforcement leaders in Berkshire County met Wednesday to discuss the drug’s impacts.